We all agree that quality hearing protection is a critical component to our health and safety when shooting at the range. It should always be worn to protect our hearing from the possibility of permanent damage. 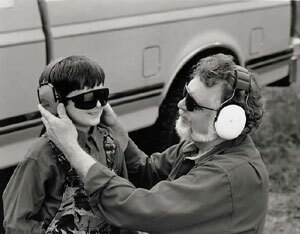 Good hearing protection is especially important with young shooters as their young ears must last them a lifetime. Because of this, we should take extra care to see that the protective devices are properly fitted to the smaller stature of young shooters. Most external devices are manufactured for adults and are sized to an adult standard. This can cause a degradation of their effectiveness in reducing the noise level of shooting. The first step is to check to see if the device being used does fit the young shooters head. Adjust the band on the earmuffs to the smallest setting and see if the cups of the muffs are positioned properly over the ear. Next, see if the cushion around the ear cup is fully sealed on to the side of the head. The best protection is useless if a proper seal is not maintained on the ear cup. If a good seal cannot be maintained, do not shoot until properly sized equipment can be obtained. In the case of hearing protection designed to be worn inside the ear, many adult earplugs are too large to be properly fitted into the smaller ear canal of the younger shooter. Be sure to obtain earplugs which are sized for children. Many manufacturers produce such specialized products. But no matter what, be sure that the ears of your younger shooter are well protected.